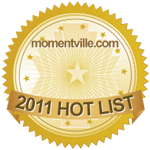 NOTE: Larry's "romantic" ceremony has gained in popularity and gets rave reviews! It's an "Award Winning" romantic wedding ceremony. Word gets around fast when something is good. If you have the slightest interest in having Larry James perform your ceremony, you are encouraged to call to check availability. He usually books anywhere from 6 months to 1 1/2 years in advance, with a few open dates in between. Weekday weddings are generally easier to schedule on shorter notice. 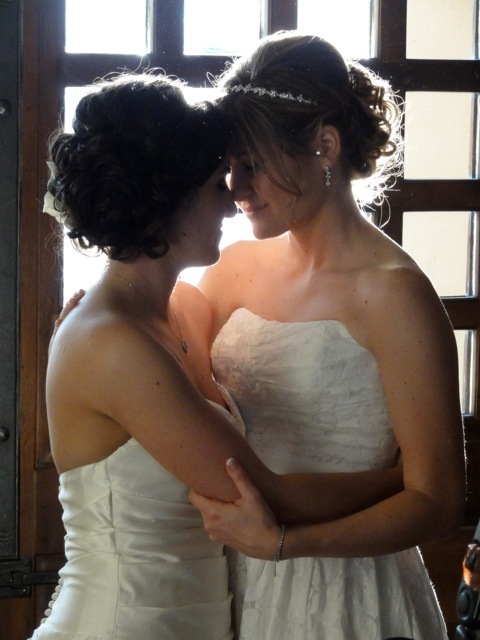 October 17, 2014: Marriage Equality in Arizona! The LGBT ommunity is welcome here! NOTE: This ceremony has a touch of traditional with a few modern twists, a slight Spiritual tint (or not!) and an emphasis on lots of love and romance! Anything goes! If you do not belong to a church, synagogue, mosque, or other religious organization, or if your family minister is not available for your wedding date, or is unwilling to travel to their wedding location call Larry James. He will do everything he can to make sure your own personal beliefs are represented in your wedding ceremomy. His wedding ceremony is spiritual, but not necessarily religious. In the final draft, it is ALWAYS what you want it to be. Without any of the add-on ceremonies, such as the Blending of the Sands, or Unity Candle, etc., the normal length of the ceremony is usually about 20 to 22 minutes. Generally speaking - even with add-on ceremonies - the ceremony will be less than 30 minutes. 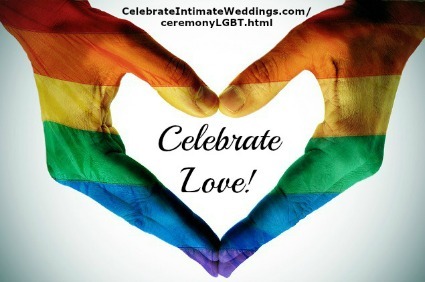 It is our most popular LBGT wedding ceremony, we use it only as a template for custom designing your ceremony! It is always customized to fit your specific needs. It's "your" day and you get to say what is in your ceremony! When the bride/groom appears, ready to walk down the aisle. . .
Minister: Ladies and Gentlemen, please rise. Minister: Who gives this woman/man to be married to this man/woman? . . . OR . . . Who supports this woman/man in her/his commitment to this woman/man? The Father: Her mother and I ... OR... Our family does . . . OR . . . I do. Minister to the Guests: Who stands with this couple to express the good wishes of their families and friends? And everyone says, "We do!" Together. . .
Minister: You may be seated. (Optional) - A nice way to honor close relatives who have passed on or others who were not able to attend your wedding. Minister: Join with me as we bow our heads to observe a moment of silence to honor the memory of those who are not with us today, but are here in spirit. (Pause briefly) Amen. Welcome, one and all. How beautiful is the day that is touched by love! May this be a moment to be remembered and cherished. Having a commitment to each other is a very special spiritual connection of two people united for a common purpose, bringing love and trust together into single focus. We have come together in the presence of God (or Love) to witness and bless the joining of this couple. The union of heart, body, and mind is intended by God for their mutual joy; for the help and comfort given one another in prosperity and adversity; and their nurture in the knowledge and love of God. Therefore this commitment is not to be entered into lightly, but reverently, deliberately, and in accordance with the purposes for which it was intended. (Optional) - Into this holy union _____ and _____ now come to be joined. If any of you can show just cause why they may not lawfully be married, speak now; or forever hold your peace. Sooner or later we begin to understand that love is more than verses on valentines and romance in movies. We begin to know that love is here and now, real and true, the most important thing in our lives. For love is the creator of our favorite memories and the foundation of our fondest dreams. Without love, we merely exist. With love, we truly begin to live! For love is a promise that is always kept, a fortune that can never be spent, a seed that can flourish in even the most unlikely place. And this radiance that never fades, this mysterious and magical joy is the greatest treasure of all - one known only by those who truly love. We are together as friends, relatives and family to mark the end of one beginning and to recognize officially a new beginning which for _____ and _____ serves as a public affirmation of their friendship and their love. Someone once said: The most wonderful of all things in life, is the discovery of another human being with whom one's relationship has a growing depth, beauty and joy as the years increase. This inner progressiveness of love between two human beings is a most marvelous thing; it cannot be found by looking for it or by passionately wishing for it. It's a Divine destiny." Ladies and gentlemen, they want this day to mean something special to you as guests. 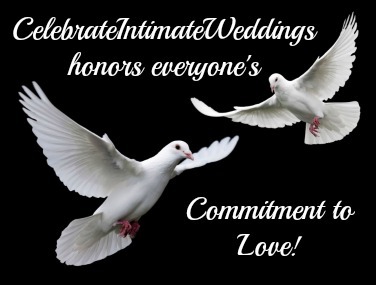 Those who are committed to each other may want to silently renew and reaffirm your vows today by gently taking the hand of your partner during this ceremony. Others may want to also join hands and think about what it means to be a friend, for commitment is built first on friendship. There are no ties on earth so sweet, none so tender as those you are about to assume. There are no vows so solemn as those you are about to make. There is no institution of earth so sacred as that of the union you will form, for the true home is not only the place in which you will live, but is also the dwelling place where each lives in the heart and mind of the other. _____ and _____, true marriage is the holiest of all earthly unions. It is to be entered into reverently, consciously and with full understanding of its significance. To be complete, marriage must be spiritual as well as an earthly estate. When it is Spiritual in thought, purpose, plan and action, it becomes the harmonious, peaceful and happy union. A successful marriage only works when it is based upon a deep, inner communion of two souls who find completion, each in the other. Today, your separate lives, each with your individual memories, desires and hopes, merge into one life - a new dimension. Happiness is not something that just happens. A great partnership must be created. In the art of commitment the little things are the big things. It is remembering to say, I love you" (out loud), at least once a day. It is at no time taking the other for granted. . . for what you take for granted, disappears. It is doing things for each other, not in the attitude of duty or sacrifice, but in a spirit of joy. It is having the capacity to forgive and not bring it up later. It is a common search for the good and the beautiful in each other. It is not looking for perfection in each other. It is cultivating flexibility, patience, understanding and a sense of humor. This commitment of marriage can be a great adventure when it is the outward expression of a great love; such a love is characterized by compassion, passion and courage. It allows you to see through to your partner's essence, willing to be in total support of your partner's well-being, goals, purpose and spirit; and unwilling for your partner to be less than all he or she can be spiritually, mentally, and physically. Always remember, "Relationships are something that must be worked on all the time, not only when they are broken and need to be fixed. Never stop doing the things that brought you together in the first place." We as your friends gathered here today, accept for you a love that brings out your magnificence, a love that gives you the courage to stand apart and the willingness to stand together. When times call for you to be apart, may you always return to your togetherness in the same spirit of love that you are feeling in this moment. Minister: _____ and _____, will you release the past, bringing only those memories, desires and hopes which will belong to each other, into your future life together? Minister: Please face each other, holding hands. Minister: At this time _____ and _____ would like to make some personal promises to each other. Minister to Bride/Groom: _____, do you reach out in love to receive _____, and choose to share your life with her/him? Will you promise always to give to her/him your expression of your ever growing love, and in this deepest of human love will you comfort her/him, be sensitive to her/his needs, express your feelings with her/him, listen to her/him, put your trust in her/him, and forsaking all others, be her/his intimate friend and honor her/him as your equal partner? Bride/Groom: "I do" ... OR ... "I will"
Bride: "I do" ... OR ... "I will"
Minister: Please repeat after me. these I offer you freely. I choose to go with you always. "I say these words because I love you, and choose to live the rest of my life with you. This is my solemn vow." Minister to Bride/Groom: _____, please repeat after me. In the name of God (or Love), I _____, choose you, _____, to be my life-partner, to have and to hold from this day forward, for better or for worse, for richer or poorer, in sickness and in health, to honor and respect, to love and to cherish. I say these words because I love you, and choose to live the rest of my life with you. This is my solemn vow. Minister: These spoken commitments to each other are the alignment of your words, which speaks boldly of your intentions... and your actions, which speak louder than your words. (Optional) - Some couples ask Larry to add a brief prayer at this time. Minister: What symbols do you give in this marriage? Your rings are circles and a circle is the symbol of the sun, the earth, the universe, of wholeness, perfection, peace and unity. Like circles, your rings have no beginning and no end and in the sacred tradition of marriage rings have come to symbolize eternal love and the endless union of body, of mind, and spirit. These rings will be worn by _____ and _____ to show to the world their love and commitment to one another. May the presence of these rings always remind you of the eternal love you have pledged and devotion you willingly share with one another from this moment on. (Silent Prayer) - Let each of us in his own way, may it be prayer, may it be by a thought, whatever you and I would wish for this couple, let's pray or have our own thoughts as a blessing upon these rings. Let us pause at this time for these silent blessings. (pause, then Amen) These rings, now blessed are a symbol of love and faithfulness. They seal the vows of marriage and represent a promise of forever love. Or... you may substitue a prayer from the minister for the silent prayer. Click here. Minister to Groom/Bride: _____, please repeat after me. I give you this ring as a symbol of my vow (Love), and with all that I am, and all that I have, I honor you. (Optional) - in the name of the Father, Son and the Holy Spirit. You may now place the ring on his/her finger. (Optional) The Blended Family Ceremony or. . .
(Optional) The Blending of the Sands Ceremony with children - Most popular of the 2 choices. Now that _____ and _____, have given themselves to each other by solemn vows, with the joining of hands and the giving and receiving of a ring, I now pronounce you, partners for life. (Optional) Have your Guests witness the signing of the Marriage License during the ceremony). Minister: At this time _____ and _____ would like for you to witness the signing of the Marriage License. The witnesses, _____ and _____ (usually the Maid or Matron of Honor and the Best Man) will join us now to make this part of the ceremony official. (Optional) The Unity Candle Ceremony - Not recommended for outdoor weddings. Minister: You may now seal your promises with a kiss. ... OR ... the traditional way. . .
You may now seal your promises with a kiss! Minister: Ladies and Gentlemen, the newlyweds request that you offer your congratulations at the reception so that pictures of the wedding party can stay on schedule. Copyright © - Larry James. All rights reserved. Under special circumstances, license to perform this or any part of this ceremony by another minister/officiant at your wedding may be granted. For full details, call Larry James: 480-205-3694. 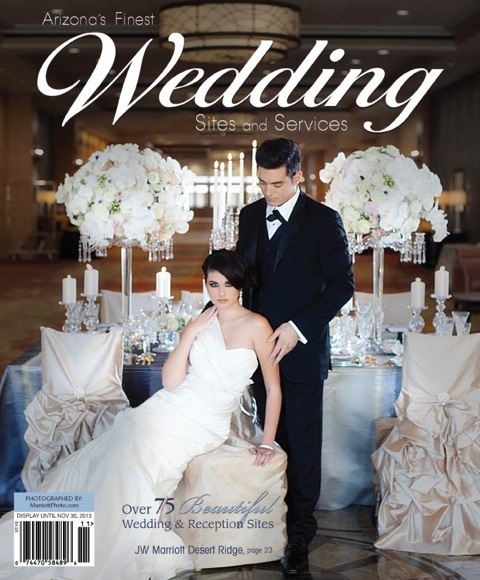 Check Larry's Availability for Your Wedding Ceremony! Use this form to check availability or to request more information. I am happy to offer you my "romantic" wedding ceremony services. You may call my Cell: 480-205-3694 or contact me via e-mail using this form. I will be in contact with you within 24 to 48 hours. For immediate requests, please call. Consultation regarding customizing my very special ceremony, attending the rehearsal (if any), and performing the wedding ceremony are included in the fee. Place a personal call to Larry James at 480-205-3694. Thank you for your understanding. You are encouraged to book the minister for your wedding as far in advance as possible. IMPORTANT: If you would like a fee quote, please CALL. Because of the many details involved in planning, preparing and customizing my romantic wedding ceremony, a fee quote is available ONLY after a no pressure, no obligation telephone consultation and after I have spoken with you about the numerous details of your wedding that may affect the fee. BONUS: By completeing this form you give Larry James permission to send you his list of "73 FREE Tips for Your Wedding, Honeymoon & More" by e-mail and to followup with e-mail and a phone call.